bought one about 7-8 years ago just now coming apart at seams especially at top, clamp came off, still use it but wanted a new one.Several people have asked me where I got it.A friend also bought one recently. I'm a Senior Citizen living on the 2nd floor and can't carry bags of groceries up the stairs. This Carry-all works perfectly for me. It never gets folded because I'm using it all the time for moving things from one place to another. The cloth covering keeps small things from falling out. Can't carry it all? This is your lifesaver. Just whip out of trunk & your done! 2nd review! I live in SE Asia and have to walk to the market and back. I have had this cart for two years now and I could not do without it! I love it! I live in apartment for senior this cart is perfect. Was easy to put together. Also easy to put away when you live in a small place. to carry your gear to paint out in the field.water colours . Mostly for grocery shopping. I have been looking for something like this but finally found this one. Got lots of compliments on it. We attend a lot of sports events involving "special needs" adults. This cart makes it very easy to store many items in limited space and also be able transport these items with little effort. 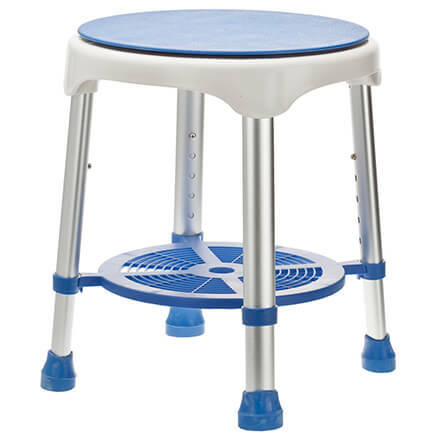 It it very sturdy and so easily folds away for convenient storage. The easy assemble and disassemble is great. I've found it is a life saver when I grocery shop...it is used to haul the items from the car to the house. great little shopping cart. THANKS!! I am using this cart to transport some game equipment when I prefer to wlk to driving there. It's great! I was lugging about 10 lbs of stuff on my shoulder and at an elderly woman it became a challenge. Now I just pull it behind and if feels like I'm pulling a feather. So convenient to take to work. This is a great cart. It is easy to put togeather. It is a best size for me. Easy to use. My mother and I both have one and we bought this for a friend to tote her groceries in. I use mine for work and my mother uses hers for groceries as well. We've had ours for several years and it's still just like new. 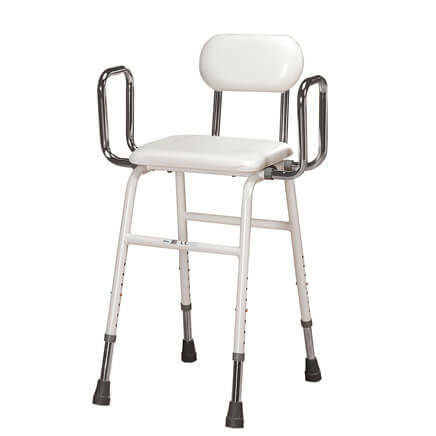 It's very sturdy and has been a back saver for many uses. Excellent for carrying on the bus folded up & then put in groceries & roll the groceries home from the bus stop. This cart is great! I've owned this cart for approximately 3 years; I don't use it daily but I do use it often to carry groceries etc. from the parking garage to our unit. I rarely buy anything before reading reviews (negative ones first!) but I did buy this before reviewing because it looked so incredibly handy (I love things that are compact) and I couldn't find anyone else who sold it where there were reviews. To the individuals who found it hard to unfold/fold back up....I agreed, at first, but if you practise a couple times (and that's all it takes) you will find it so much easier. I unfold it constantly, in an area that isn't well lit and it's no problem. For those who thought it was heavy, unfortunately if you want something sturdy, that can't be helped (I didn't find it heavy but that is a personal opinion). I purchased my cart from Miles Kimball over 10 years ago, I've used it for laundry and grocery loads, and during moves. It's been through all kinds of weather and over all types of terrain and it's still in good condition (the bottom has slight rusting because I've even dragged it through rain and puddles! It would probably be in even better condition if I'd been nicer to it!). I'm glad they now have a review section because I've been boasting to one and all about this cart forever! I just wanted to let anyone considering purchasing this item that they will NOT be disappointed! Very useful. I am a widow who doesn't drive . This is easy to use & lets me be independent! very well made. would buy again. i purchased for my mother. she can make one trip from the car. 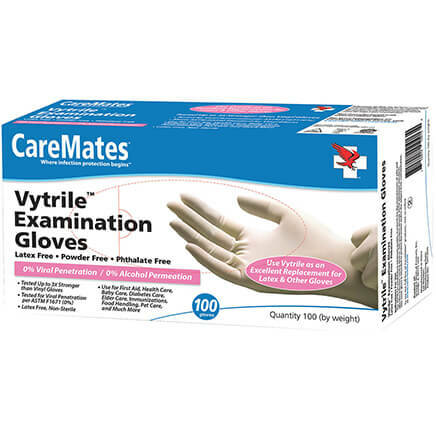 GREAT PRODUCT,STRONG AND EASY TO HANDLE. I LOVE THIS PRODUCT. EASY TO TAKE ON THE BUS TO GO SHOPPING. EASY TO STROLL IN DOWNTOWN PARK RIDGE. LOOKS GREAT. Great Cart and Excellent Customer Service!! I have been buying these carts for over 30 years. The first one lasted 10 years!! They are invaluable! Strong (they hold up to 80 pounds, amazing) and when folded it is like carrying a purse. I often take it with me just in case I end up shopping which happens a lot. When I open it in public, just about everyone watches and looks amazed. They say how great it is and wish they had one. I just say Miles Kimball. I just purchased another one for me. Also one for my Mom, Sister and her Friend (who bought some for Xmas gifts). For a long time I could not find another and via a search they finally showed up here and I was so happy. Several years ago I bought something similar from Miles Kimball competition. It was garbage, a terrible knock off and returned immediately. I totally recommend this cart and think you will be very pleased if you buy one! Most small shopping carts like this do not have the bars at the bottom which are part of the wheel base like this cart has....and this cart also has added supports for those bars. I have a similar cart which is getting old so I bought this as a backup and haven't used it yet.......just wish wheels were as wide as on my old cart. Anyway, I put my old cart through hell weight-wise over the years and this cart is designed exactly like my old one in every other aspect except for the wheels (which are larger but thinner than my old cart) so I'm expecting the same sturdy/rugged performance. I would definitely give this cart a try.....it also looks like a quality cart, is a nice color blue, and has a little pocket on the outside for coupons or maybe a small fold-up umbrella. It also folds nicely. I do merchandising in dept/discount stores and often while at the stores I have to pick up items for home and since I don't drive I ride the bus. After work if a purchase items I can unfold it pop my stuff in it and hop on the bus. It is small enough I can slide it between me and the seat ahead and it has enough clearance underneath for my feet. It has a confort grip handle and a small pocket at top in the back perfect for the bus map. THIS IS A KEEPER!! I've looked at several brands and this is the sturdiest, smoothest rolling, highest ground clearance, perfect sized and non-tipping rolling cart I've found. I love it! I have had this cart for over 10 years and love it. It has many uses both inside and outside the house. Trips to any store, taking out the recycling, picking up around the house, carrying laundry to be put away. It's sturdy, built well, easy to assemble, lightweight. Not enough roomd for all the great things about it. I have had mine for over 5 years and I use it on a weekly basis. Every time I am at the store and start putting it together someone asks me where I got such a wonderful cart. My answer is and always will be MILES KIMBALL!!! Rides easy. Seems to be sturdy. I like it. Love it for brining in the groceries, holds alot. A great product with many uses! The carry all is light weight but very durable, and it is a big help to me getting the groceries in the house. It can easily carry 8 bags at a time and makes getting the groceries in much faster. This product is perfect for me to go shopping with, I have had quite a few people ask me where I got it and I told them. It has never let me down by breaking down on me. What a great carryall !!!! 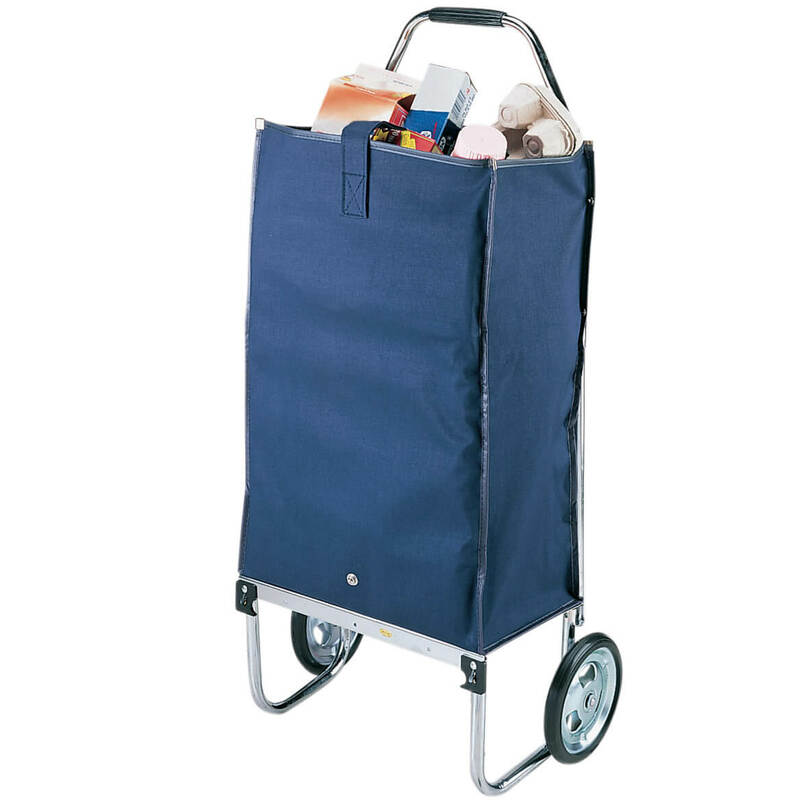 This carryall cart really helped me out when I went shopping, the carryall held a lot. The extra metal I found on the back of the cart does not stay up at all. Was on sale. excellent value @ sale price. Glad That I Ordered It! I live in a Senior hi-rise apartment building and use my carryall just about every day. It is lightweight but sturdy. I can easily get my groceries up to my apartment or my laundry down to the laundry room. Very happy with my purchase. The bag is sturdy and compact. It folds easily and the storage space is minimal. I bought one of these several years ago and have used it for going to the laundromat. I also take it in my car to the supermarket. I put all my bundles in it and cart it across the street and up the stairs. The rain cover is unique to any other cart i owned. I absolutely love this product. It is so handy! 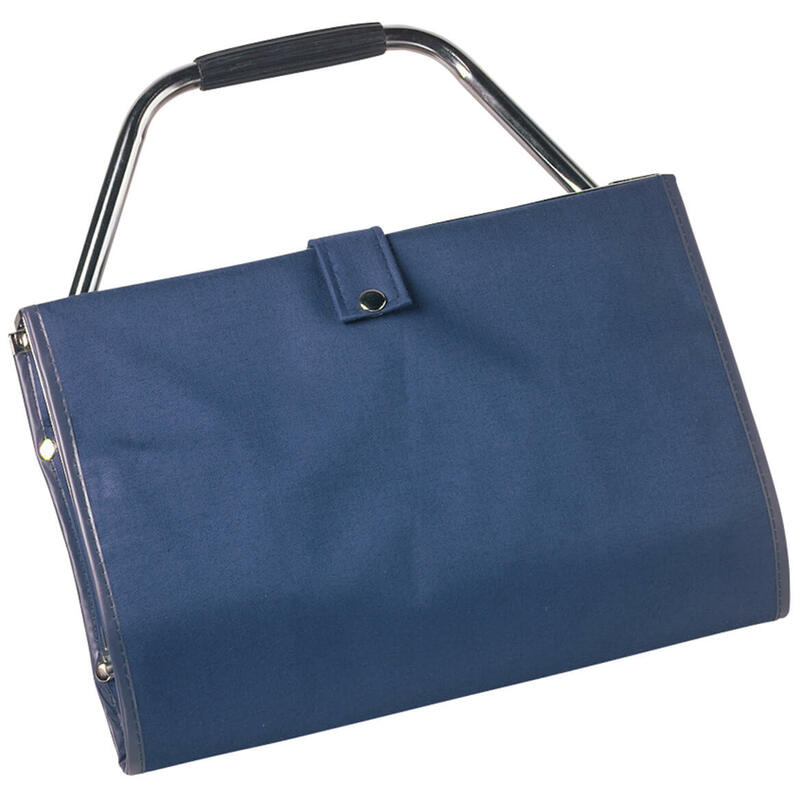 This is not a big carryall but it is strong and easy to fold and unfold. Good for when you have a small amount of groceries to bring home. 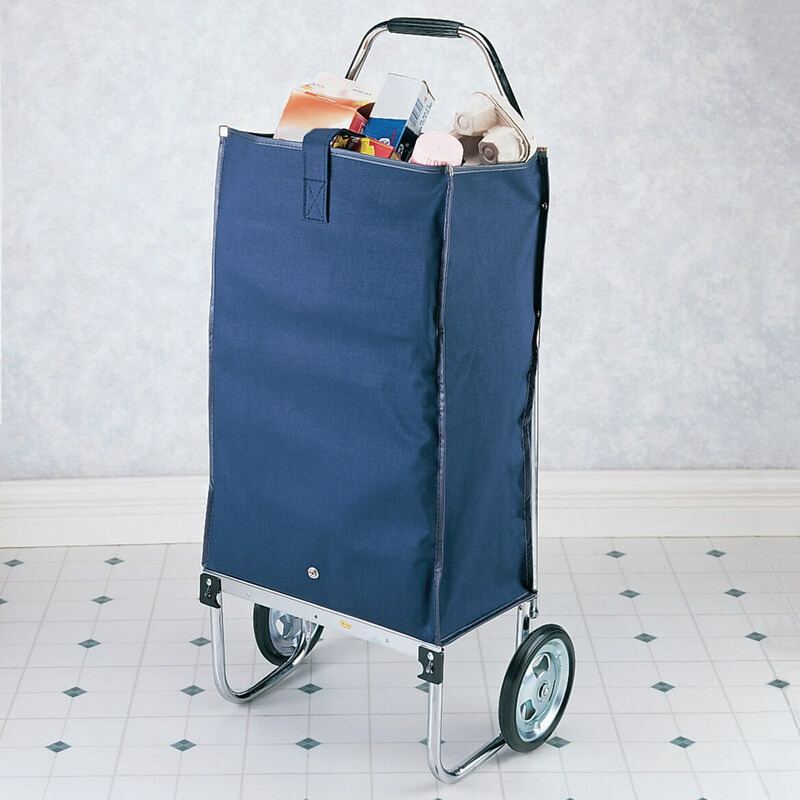 I had been looking for a replacement to a fabric,foldable cart that could be purchased individually (vs.wholesale lots). This one is easily unfolded when I am ready to check-out at the store and is easily carried when folded up. The wheels are much larger and sturdier than the last cart I had. It is easy to maneuver up and down curbs and rolls easily, even with a heavy load. As one who walks to the market, I am very happy with this product. We live in a large condo complex. Putting my puchases in especially 2 gallons of milk amongst other grocery items, cart comes in very handy to just wheel to elevator. When cart is full it would be easier to have 4 wheels, this way I could push the cart instead of pull. I live in SE Asia and I have to walk to the market and hand carry my groceries home. Food is heavy!!! The cart really makes it easier for me. Not as sturdy as I thought it would be, but I'm careful. I'm glad I bought it! I did not give this 5 stars because the directions were not very explicate, but once I accomplished that, I was happy. I have limited storage space where I live, so this is ideal. Used it once and it held more than I thought it would. Great price also. I bought this tote when I had film class. It was a life saver. It does require a minute or two extra with assembly if you want to fold it up to store it each time it's used. I keep mine set up in a corner so that it's ready when needed. I didn't find the construction flimsy at all. I thought that the makers of the product were probably trying to cut down on the weight of the cart. I don't want to lug around a 50 lb cart. I'd buy it again. I'm getting one for my mom. Costs as much as large shopping carts but has to be replaced way more frequently, however, is invaluable when I want to do my grocery shopping right after work. Easy to carry on the subway when folded. I have ordered this product numerous times over the years. Go to the movies or whatever then go food shopping. Stopped all the time and asked where did you get this? It would be easy to bring my groceries upstairs. 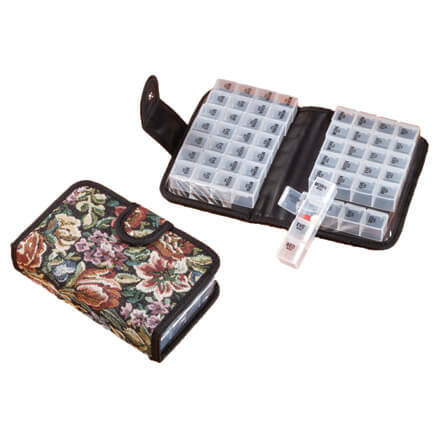 I got this for my mother, this would be great for items she get at grocery store it is small enough for her to take on the bus and would not have to take it down. So I hope this would be good for her, will repost if it is not all that, keeping my fingers cross that she will love it. To use for laundry while RVing. This item was removed from this order,it was purchased previously. I like it very much. The bus here takes us to shopping at Walmart and I need a cart to carry the things I buy. After retiring to live in an apartment complex I will need to transport my groceries from my car to ride the elevator to my future residence. Never used this model but it's so convenient to carry in your bag and I can't find them in stores anymore. Can pack in a suitcase and use when going to embroidery conferences to haul all my stuff. Easy use for my mother, she requested it as well. Hoping it works going up and down stairs and can carry at least a load but hoping to get 2 in there since a is a pan . I recently ordered a stair dolley from Miles Kimball & it's in constant use & we can use more! I love the versatility & collapsible storage aspect. I bought this a few years ago and wanted another. Being able to fold it to a briefcase size is very convenient. Attend a lot of home shows and women's shows. Nice for hauling my purchases. I have a much older version which I love. 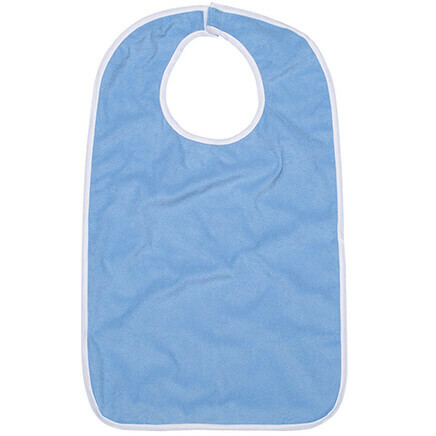 It's great for shopping and folds up easily. I have multiple sclerosis and my balance and strength waver. This will help me after shopping to get things inside. My old one finally wore out. I need a cart to get groceries from the parking lot to my condo. Just a very item to have around. great products, love the fold-able feature for space saving when not in use. I brought one for myself and two more for my family as they love it so much. For disabled person to help them carry stuff in. Because i know it"s just what i need. Own one a long time ago and loved it. It is as advertised. Have had this cart and another one for years. Need to fold it up and can't remember how. Help ????? BEST ANSWER: Turn it upside down. On back bottom there are 2 - 45 degree thin clips, lift them out of the leg and fold to the inside on both sides. Turn it around to the front, then mash the black plastic buttons on each leg down, and then fold wheels in. then turn back over to back, in the middle are two small brass buttons, push them down and then slide the top off the rails, then fold back tubes down and then just fold the rest up. I can not help because I never fold it up. BEST ANSWER: Thank you for your question. This item has a weight of 5 pounds. We hope this information helps you. Where do the 2 metal strips go near the wheels? BEST ANSWER: They help stabilize the wheels. The little bumps on the ends of the metal strips should be pressed into the holes on the backs of the tubes that the wheels are mounted on, to prevent the wheels from collapsing back inwards. Whoever took the photos forgot to use them, so you don’t see them in the pictures. They go on metal poles that allow the unit to stand in it's own. Could this be used to transport portable oxygen tank instead of a backpack? BEST ANSWER: Thank you for your question. Unfortunately no I would not recommend using this as a backpack. We hope this information will be of help to you. What is the weight limit it will hold? BEST ANSWER: Thank you for your question. The weight limit is 88 lbs. We hope this information will be of help to you. Does this cart come in another color? BEST ANSWER: Thank you for your question. We have reviewed our information and unfortunately the carry all cart only comes in the blue pictured. We hope this information will be of help to you.